September is a busy month for the Friends of Cedars of Lebanon State Park. Please mark the following dates on your calendar and participate when you can. September 6 – Disc Golf Course Clean Up at 9:00 AM. Meet at the Disc Golf parking lot behind the pool a little before 9:00. Ranger Shauna has a scout troop coming, and with luck a group of disc golfers, to help clear low-hanging limbs, pick up litter and spread mulch around some of the baskets. If you can help with this effort, please do. The Friends will provide lunch (pizza & drinks) afterward. September 13 – Picnic Table Pressure Washing Party at 10:30 AM in the Nature Center parking lot. The plan is to move the picnic tables (by tractor or truck/wagon) from the shelters to the parking lot where running water is available. We will douse the tables with bleach and water, hit them with the pressure washers, then move them back to the shelters. Bring gloves, and dress accordingly. You’re going to get wet. September 13 – Monthly Meeting of the Friends of Cedars of Lebanon State Park will take place after we finish cleaning the picnic tables. Location has not been announced, but possibly at shelter #5. September 27 – National Public Lands Day at Cedars of Lebanon State Park begins at 9:00 AM with a morning hike led by Ranger Shauna. At 10:30 we gather at the Nature Center parking lot for work detail. We will be painting the picnic tables that we pressure washed two weeks earlier. The tables will be painted at the shelters. Also, we will be removing unwanted vegetation and picking up litter around the shelter sites. Wear old clothes and bring gloves. Finally, that evening we will host a campfire & cookout behind the Butterfly Garden (which is behind the Nature Center). The Friends will provide hotdogs, buns, condiments, drinks and marshmallows. Please feel free to bring guests to any or all of these events. We are still a small group so we need all the help and hands we can muster. If you have questions or suggestions, send us an email.Thanks for your support of our park. I look forward to seeing you among the cedars. 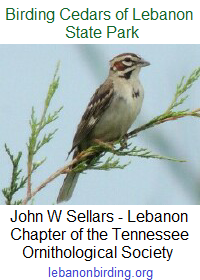 This entry was posted in Announcement, Public Event, Volunteer Projects and tagged Cedars of Lebanon State Park, FoCoLSP, friends of cedars of lebanon, Lebanon TN, National Public Lands Day, NPLD, Tennessee State Parks. Bookmark the permalink.